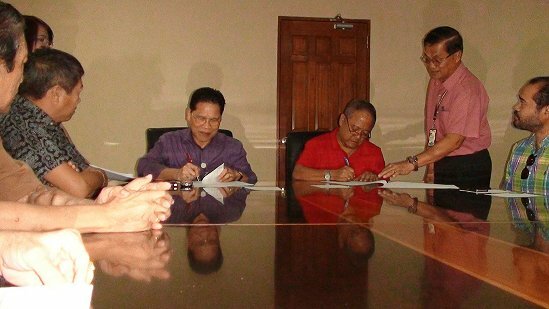 Dr. Pedro A. Noval Jr. CESO III DILG 8 Director (left) and Mayor Edward "Ondo" C. Codilla (on red polo) sign the Memorandum of Agreement on Regulatory Simplification Project (RSP)-Enhanced Business Permits and Licensing System (BPLS) while business sector representatives witness the occasion. ORMOC CITY – Ormoc City Mayor Edward “Ondo” C. Codilla and Dr. Pedro A. Noval, Jr. CESO III DILG 8 Regional Director signed a memorandum of agreement last Friday, August 30 in the New Ormoc City Hall. The MOA between LGU-Ormoc and DILG 8 in coordination and active participation with the Local Government Academy and International Finance Corporation-World Bank which entitled Regulatory Simplification Project (RSP)-Enhanced Business Permits and Licensing System (BPLS) is designed to introduce reforms that would enhance the competitiveness of LGU, encourage the formalization of business and more investment by further enhancing the streamlining of business registration procedures and to furthermore reduce the number of steps, time and cost of business registration at the local level. The LGA and IFC-WB shall extend funding support and provide the necessary and essential consultancy services in line with the project implementation specifically in the diagnosis, design process and implementation. DILG 8 shall facilitate and oversee the overall implementation of the project while LGU-Ormoc shall take the responsibility in both the quality of work and the progress being made toward successfully achieving the goals. Business sector representatives present, showed their strong support in the implementation of the project. Roger Uy Ormoc Filipino Chinese Chamber President, Iñigo Larrazabal, OCCCI President and Atty. Roy Bernard Fiel, Governor EV Chamber of Commerce said that they are very willing and excited to be partnered with LGU and with the government. Dir. Noval said that it was his first time he signed a document related to governance in Ormoc. Saying it could be another milestone in his life as DILG regional director especially Ormoc as one of the LGUs in Eastern Visayas considered to be progressive and that could be pivotal aspect as far as local governance including development in this region. He added that through this project it could strengthen the economic development of this city considering that it will simplify and reduce and even eliminate red tape in issuing business permits. He hoped that this program will make Ormoc a business friendly. If happens LGU-Ormoc in partnership with the business sector will be helping the president in realizing his vision to have an inclusive growth and poverty reduction. The regional director lauded Mayor Ondo that without second thought the chief executive accepted in adopting and implementing the program in this city. Ormoc already gained the most friendly-business city award in 2005, said Emilio Tingson, BPLO-Ormoc. LGU did not refuse the program for it could help in improving the system, Tingson added. Tingson recalled that city’s commitment to GTZ has already expired and now IFC-WB showed in extending their assistance. Currently, BPLS in the city has only 3 steps and can get permits in just 30 minutes. It could be the existing laws that might be reviewed, Tingson said in an interview. Meanwhile, Mayor Codilla welcomed the program and was very grateful to the business sector’s support. QUEZON CITY – “Local government secretary Mar Roxas should be held accountable for the organized racket of the Department of Interior and Local Government (DILG) and the Department of National Defense (DND) through the P466 million bounty for individuals whom they accuse as communists,” said Karapatan secretary general Cristina Palabay. The Karapatan statement was issued in time for the hearing of the DILG 2014 budget by Committee on Appropriations at the House of Representatives. Palabay said the joint DILG-DND memorandum 14, announced by Roxas in November 2012 provides for P466 million reward for those who can provide information that could lead to the arrest of 235 wanted individuals listed as “communists”. The said list has been kept confidential until now and, even during the DND budget hearing at the House of Representatives last Sept. 3. Karapatan called the scheme an “organized racket,” citing the cases of arrests, torture and detention of security guard Rolly Panesa and farmer Olegario Sebas. Both were wrongly tagged as leaders of the Communist Party of the Philippines (CPP) and the New People’s Army (NPA). “The reward money is better used in productive endeavours that will benefit thousands of hungry and homeless Filipinos instead of pay-offs to so-called informers who are used to arbitrarily arrest, detain, torture or kill innocent people,” Palabay added. Panesa was arrested on October 5, 2012, tortured and detained for 11 months because he was mistaken to be “Benjamin Mendoza”, an alleged high ranking regional officer of the NPA. On August 29, the Court of Appeals (CA) ruled positively on Panesa’s petition for writ of habeas corpus, citing his case as a case of mistaken identity, and ordered the jail warden of Camp Bagong Diwa to release him from prison. Sebas, 65, was arrested on December 25, 2012 by the joint forces of the Philippine Army and the Philippine National Police in Tubod, Manjuyod, Negros Oriental. Sebas was mistaken to be the top NPA cadre “Felimon Mendrez”, a subject of four arrest warrants for rebellion. Sebas was detained in the BJMP District Jail in Bayawan City for three weeks and was released when the court granted his petition for writ of habeas corpus. Last month, AFP Chief of Staff Gen. Emmanuel Bautista personally handed P5.25M and P5.6M rewards to informants who “identified” Panesa as “Benjamin Mendoza” and Sebas as “Felimon Mendrez,” respectively. “Now that the Courts have ruled in both cases that they got the wrong men, the big question is where is the P10.8 million bounty? Or has the money been pocketed already by entrepreneurial generals?” Palabay asked. Karapatan research showed that the DILG has P73.6 billion at its disposal for the implementation of the counter-insurgency program Oplan Bayanihan, including P306 million for intelligence funds. “Many of these items, including intelligence funds and the budget for PAMANA program, are discretionary in nature and are not subject for audit by the Commission on Audit (COA). These programs are also conduits in the implementation of Oplan Bayanihan’s components, specifically the psyops and intelligence aspects,” Palabay added. PASAY CITY – Officials of the ZNAC Rubber Estate Corporation (ZREC) and National Agribusiness Corporation (NABCOR) were grilled by Senator Chiz Escudero on their knowledge of the government procurement rules during the second hearing of the senate blue ribbon committee on the pork barrel scam. ZREC and NABCOR are two of the government implementing agencies Escudero last week asked to be invited to the hearing for their roles in awarding funds to non-government organizations (NGO). The senator said under the Government Procurement Policy Board’s (GPPB) Resolution No. 12-2007, which stipulates guidelines on NGO participation in public procurement, there are only two modes of awarding a project to an NGO. One is by public bidding, two is by negotiated procurement. Escudero was baffled when Allan Javellana, former NABCOR president admitted before the committee that mere endorsement by a legislator already prompted them to award contract to a particular NGO. “Who told you that those are the only requirements?” Escudero asked. “Was just a policy that was inherited by ZREC,” Salacup answered. Escudero also asked Salacup if he is familiar with the COA and GPPB rules on NGO participation in public procurement to which the latter said no. Escudero said with the appalling wastage of public funds from the PDAF, he wants to examine if there are remaining pending or on-going PDAF allocations to be implemented by NGOs. “No matter how late it may seem, we might be able to preclude further depletion. We directed DA Secretary Proceso Alcala to furnish the committee with an inventory of this,” the senator said. PASAY CITY – Senate Majority Leader Alan Peter Cayetano placed his "complete and unequivocal support" for the passage of the controversial Freedom of Information (FOI) Bill in the 16th Congress. In a letter he sent Senator Grace Poe, chairperson of the Senate Committee on Public Information and Mass Media, he expressed his full support for the immediate passage of the FOI bill. "I write to express my complete and unequivocal support for the passage of the Freedom of Information (FOI) Bill into law," said the Senator. He told Senator Poe that as a fellow advocate of the measure, he shared her "belief that the recent controversy on the misuse of Priority Development Assistance Fund (PDAF) would have been avoided should there have been an FOI law passed in the 15th Congress." He also endorsed the petition for indirect initiative on the FOI Bill filed by Atty. Nepomuceno Malaluan of the RIGHT TO KNOW. RIGHT NOW! COALITION. Cayetano urged the committee chairperson to invite the said coalition to the hearing Wednesday in the Senate as they were "major stakeholders in our struggle towards transparency, accountability and reform." The Majority Leader, who has consistently pushed for the approval of the measure, lamented how the FOI Bill perished despite its passage in the Senate during the 14th and 15th Congress. "It never passed the 3rd reading in the House of Representatives in the 15th Congress. In the 14th congress, the FOI Bill went as far as passing the Bicameral Conference Committee, but was not ratified into law by the House of Representatives," he said. The Majority Leader however voiced optimism that the 16th Congress would see the passage of the FOI Bill. "There is so much clamor for truth, transparency and accountability that there is no way that the people will allow the FOI Bill to perish once again. I am confident that it will become a law this time with the help of the Filipino people who have been outraged by the abuse of government funds," he said. Cayetano, on the first day of the 16th Congress, filed his updated version of FOI bill. According to the senator, the legislative measure will help the government in abolishing graft and corruption and ensure that the people’s money will be spent on programs that will help the people in their daily struggles. “The FOI enhances people's participation and institutionalizes systems to strengthen citizens' vigilance in guarding the government by making information more accessible to those who have the right to know," he said. “By passing the FOI, we can institutionalize the government's efforts in implementing Tuwid na Daan," he added. TACLOBAN CITY – The Vice Governor and the members of the Board Members of the province of Leyte have collectively agreed to institutionalize the paperless system in the Sangguniang Panlalawigan. Leyte Vice Governor Atty. Carlo P. Loreto told the Philippine Information Agency that the paperless system is now being used in the Sanggunian. “At the onset, the new system will normally entail some major changes and new procedures to follow which may be perplexing to some of us,” Vice Governor Loreto said, Nevertheless, he gave the assurance that with the assistance of the technical personnel, the system will be adapted as expected. It was learned that the members of the provincial board now have tablets which they could open and use anytime and anywhere to see and to study the Agenda for the next session. Vice Governor Loreto said the institutionalization of the paperless system in the Sangguniang Panlalawigan is in harmony with the Provincial Government’s persistent advocacy for the protection and preservation of the environment and in compliance with RA 8972 or the Philippine Electronics Commerce Act of 2000. The initiative introduces a real time transmission of the Agenda and all matters that has to be considered during the regular sessions of the Sanggunian to the presiding officer, the members of the Provincial Board and to all concerned. Henceforth, it shall be the standing policy of the provincial board to minimize the use of papers and plastics in the sessions of the Sangguniang Panlalawigan. Another policy is for the Municipal Sanggunians within Leyte and the Sangguniang Panglungsod of Baybay and all government and non-government entities transacting official business with the Provincial Board shall be required to submit only 1 hard copy and one soft copy in digital format of any document that has bearing with their official transactions. The third policy, according to Vice Governor Loreto, is for the Sangguniang Panlalawigan Secretariat to send by email or through any electronic mode of transmission, all proposed items in the agenda of the forthcoming session every Thursday of the week to the vice Governor and the Floor Leader. Thereafter, the Vice Governor or the Floor Leader will email the approved agenda to the Board Members, the SP Secretary and the Governor. With the paperless system in place, Vice Governor Loreto said, the Sanggunian will be instrumental to the reduction of paper consumption, a significant contribution to environmental advocacy. He said that the production and use of paper has a number of adverse effects on the environment known collectively as paper pollution. Pulp mills contribute to air, water and land pollution, he said. It also contributes in deforestation, he said. Moreover, the paperless system will save time and effort in submission of voluminous documents to the Sanggunian. It will also redound to savings for the provincial government, Vice Governor Loreto said. It may be recalled that the implementation of the paperless system has been initiated during the term of then Vice Governor Mimiette Bagulaya with the help of the Department of Interior and Local Government. However, it is only now during the term of Vice Governor Loreto that it is fully implemented. PASAY CITY – The senate committee on finance approved the proposed P2.8 Billion 2014 budget of the Office of the President (OP) and recommended the same for plenary deliberations. Senator Francis Escudero, chairman of the finance committee said OP’s budget proposal, presented by Exceutive Secretary Paquito Ochoa, Jr. breezed through the committee because no other member attended the hearing and no issues were raised when the executive office presented its budget proposal. The senator also said that traditionally, the OP and the Office of the Vice President, respectively are given due courtesies with respect to their budgets. Escudero said even the lump sum amounts associated with the OP and which has been critiqued as of late belong to the special purpose funds which lie on the Department of Budget and Management’s (DBM) responsibility to defend. “Even the social fund is not in the president’s budget. The DBM will defend the special purpose funds to include calamity fund, contingency fund, and feasibility studies fund; all the lump sums that are being questioned by the public and the media or even the lawmakers fall under the DBM. They will address these issues during the plenary come November” he explained. The senator however said that even though the president’s social fund does not go through congress, it is still subject to Commission on Audit’s (COA) rules and regulations and guidelines. The OP budget for 2014 is 3% higher than its 2013 budget which was P2.73 billion. Palabay cited the use of MG520 by the Air Force 1st Division’s Strike Wing on August 31 on suspected lair of the New People’s Army, destroying communal hunting grounds, uma (farms) and, water sources near rice fields and communities. Earlier, on August 23, Blaan tribal chieftain Anting Freay, 60 and his son 16-year old Victor were killed by elements of the AFP’s 39th Infantry Battalion and Task Force Kitaco (Kiblawan, Tampakan, Columbio) Task Force Kitaco was created under the 1002nd IB-PA to secure the areas covered by the SMI-Xstrata’s mining project. The Freays were killed when their house was strafed by the soldiers who were positioned three meters from their house. The older Freay was immediately killed while his son sustained 18 gunshot wounds when he was fired at by another group of soldiers. “Public funds are being used to kill the people and perpetrate thousands of rights violations. Under Aquino’s counter-insurgency program Oplan Bayanihan, Karapatan has documented and recorded to 142 documented cases of extrajudicial killing and 164 frustrated killing; 16 incidents of enforced disappearance; 76 cases of torture; 540 cases of illegal arrest; and more than 30,000 victims of forced evacuation,” Palabay said. Included in the DND budget is the allocation of P2B for compensation of the Civilian Armed Forces Geographical Units (CAFGUs), despite wide and persistent clamor for the disbandment of paramilitary groups, civilian volunteer organisations and private. The European Parliament and several States also called on the Philippine government, in the Universal Periodic Review in 2012, to immediately disband all paramilitary groups. Palabay said Karapatan also documented several extrajudicial killings and human rights violations since 2010 involving paramilitary groups, such as the incidents involving Datu Jimmy Liguyon, Fr. Fausto Tentorio, and the massacre of Juvy Capion and her two children. “Similarly, the operations of the Special CAFGU Active Auxiliary (SCAA) units, which are co-funded and organized by the AFP and mining/transnational corporations, have continued, with Pres. Aquino categorically giving the go-signal for it on October 20, 2011. The question then is why are we still funding CAFGUs and SCAAs?” she asked. Karapatan’s research showed the Oplan Bayanihan budget, with at least a total of P162 billion, is allocated in various government agencies. “The Filipino people deserve better than a government that is repressive and corrupt. It is the people’s right to have access to health services, to medical attention, to attend school and to better education and, to decent housing at the very least. We can no longer tolerate a government that has nothing to offer the people but PR spins and catchphrases of goodwill while violating the people’s rights at the same time,” Palabay concluded.